Natural cork has a confusing system of different qualities, which could be a lot more simple, but unfortunately isn’t! The basic classification system for natural wine corks or natural capsulated (bar-top) corks starts with the very best corks “Flor”, which should have no surface imperfections, just the occasional visible line, then it goes down to Extra, then Super, then First, Second, Third, down to 7th and reject. Generally anything below Third quality will be colmated (the holes filled in with cork dust), or the corks will be recycled into something else (either granules or smaller corks). For wines or spirits of a reasonable quality, generally natural corks of Second or higher qualities are used; in terms of mechanical properties, there is really not that much difference between a Second quality cork and a Flor one, with a great of the difference being aesthetic. 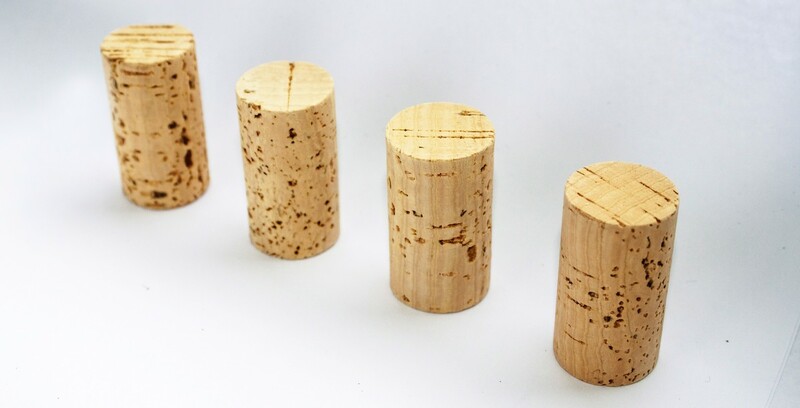 A Second class cork will generally provide a good seal for a bottle, and will not tend to crumble, but for higher quality corks you are paying for small increases in performance and large increases in aesthetic appeal. To complicate things a little further, there is no official agreed classification for natural corks and each producer has their own system. Furthermore, there is quite a lot of blurring of boundaries between classifications, so you might buy First/Super corks for example, or sometimes even a “good” First. Then there are the bad guys, the suppliers who willfully mislead their customers by mixing in lower classified corks in with an order. Because there is a big difference in the price of different classifications of corks, there is of course a big temptation for a supplier selling Super quality corks to sneak in 15% of First quality corks and only the most knowledgeable of customers would spot the difference. And then if the customer spots it, there is no way of “proving” this, because there is no official classification system to refer to. And then there is a final layer of complexity which is how the natural cork classification system works in different countries; unfortunately in some countries, local distributors have been ripping off their customers for so long by selling lower quality corks and palming them off as something better, that their national market has developed a distinct classification system where for example a cork that comes out of Portugal as a First will be known as a Super within that particular country. Then if a Portuguese supplier tries to sell directly into that market and does not understand the distorted local classification system, their corks will appear more expensive. So for example if they try to offer “genuine” Super corks, they would have to compete with the First quality corks being sold by the national distributors. The truth is that the best place to buy corks from is directly from Portugal and from a reputable supplier; always ask for samples before placing an order and keep those samples somewhere safe so that you can compare them to the deliveries you receive over the years. You also need to accept that if you try and drive the prices down of your supplier too much, you may find that they will slowly decrease quality, by sneaking in some lower quality corks into each batch, so it is very important to establish a good working relationship with your supplier, so that you can speak openly about prices and quality. If you are able to find a competing cork supplier who will offer you a cheaper price than you are paying, it might well be that despite all their protestations, they will not provide the same quality, so it is a real risk you take if you are constantly trying to find a lower cost supplier.